The Iodine Global Network, with support from the Pan American Health Organization (PAHO) and UNICEF, is conducting the first ever survey of iodine nutrition in nine Caribbean countries. Dubbed the 'Caribbean Island Urinary Iodine and Salt Survey' (CRUISE for short), the study will provide new information about iodine intakes in the region and help the countries determine the risk of iodine deficiency in their populations. Leading the CRUISE is Prof. Michael Zimmermann (Iodine Global Network, and Swiss Federal Institute of Technology). 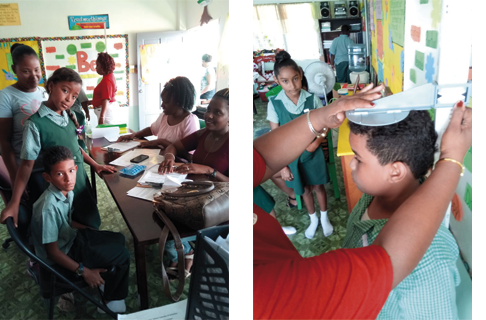 Over the past few months he has travelled across the region, collecting spot urine samples to estimate iodine intakes in school-age children in Jamaica, Antigua, St. Kitts & Nevis, St. Lucia, Grenada, St. Vincent & The Grenadines, Trinidad & Tobago, Belize, and Barbados. Speaking on TV Channel 5 in Belize recently, Prof. Zimmermann explained that mild iodine deficiency may not always lead to thyroid enlargement (goiter), but it can still affect brain development and decrease child I.Q. CRUISE will provide iodine nutrition data which will help governments plan corrective action. 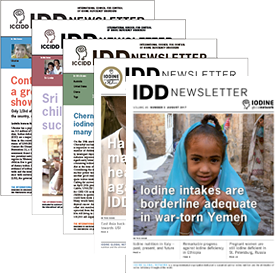 Over the past decades, many countries in Latin America have reported iodine deficiency and adopted prevention programs to provide the missing micronutrient through iodized salt. The Caribbean sub-region has lagged behind with collecting the data on iodine intake because it is often taken for granted that island populations are iodine sufficient because of their fish-based diets. Iodine is a mineral important for the correct function of the thyroid gland. An underperforming thyroid can affect the functioning of the whole body. Particularly in young children, iodine deficiency can limit their ability to develop, learn, and ultimately thrive in their community. A classic sign of severe iodine deficiency in both children and adults is goiter – a swelling in the neck which indicates that the thyroid gland has become enlarged. Speaking on TV Channel 5 in Belize last week, Prof. Zimmermann stressed that, although milder iodine deficiency may not always lead to thyroid enlargement, it can still affect brain development and I.Q. “In pregnancy and early infancy, thyroid hormones are critical for normal maturation and development of the brain. In school-children, whose brains are formed, mild iodine deficiency could still affect how well the brain processes information, concentration, and memory,” he warned. Approximately 550 schoolchildren between the ages 6 and 12 years took part in the national survey in Belize. In addition to measuring iodine concentration in urine to reflect recent iodine intake in the population, the study will measure the sodium content in urine, iodine content in household salt, and information about other sources of salt and iodine in the diet. The ongoing study is serving to raise the awareness in all participating countries of the need and importance of having adequate iodine in the diet, and encouraging people to include iodized salt and more fish and seafood in their diets. The full survey results will be available later this year. Lead investigator, Prof. Zimmermann explained why the survey was commissioned and what should be done after the results are in.